Pav Bhaji is one of my favorite Indian dishes. It’s loaded with veggies, healthy, vegan, gluten-free, and of course, flavor. 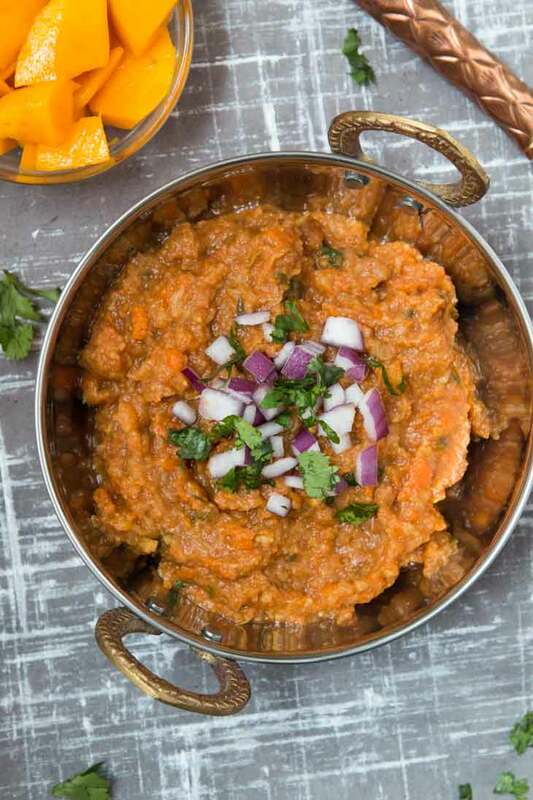 This easy-to-make Pav Bhaji Masala recipe consists of a thick vegetable curry served with grilled bread, and is a great meal for the entire family! Pav Bhaji is one of my favorite Indian dishes to make, and the first thing I crave when I haven’t had enough veggies throughout the week. I’ve watched my mom make it growing up and have since then adapted it to my own taste using my favorite ingredients. I typically make this at least 2-3x a month because my entire family loves this dish. 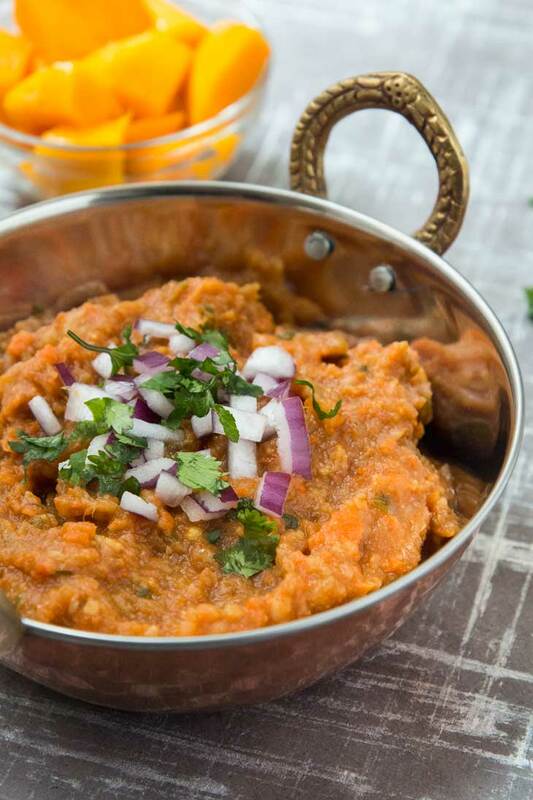 Before I dive into this recipe, let me tell you a little more about Pav Bhaji. It’s a famous popular ‘fast food’ dish from India, and literally means bread and mixed vegetables. Pav Bhaji basically consists of a thick vegetable curry served with grilled bread. In today’s world, you can find it everywhere…from formal restaurants to food carts strolling down the streets of Mumbai. Pav Bhaji Masala is not just cooked diced vegetables mixed in with some spices. Instead, the flavor comes from having cooked all the mashed veggies together. The veggies are all steamed, mashed, and cooked with several spices making it one of the best thick vegetable curries ever! Add in the grilled bread and you have yourself a perfect meal! Also, it’s a great dish for picky eaters since there are no large pieces of vegetables to deal with, and you can modify it to your liking. My kids started eating this pav bhaji masala recipe when they were 2 years old and have loved it ever since. They particularly enjoy scooping the thick curry onto the grilled bread before taking a bite. 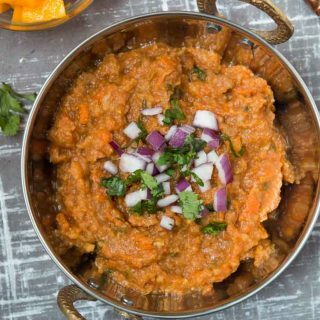 My pav bhaji masala recipe is healthy, made with fresh and simple ingredients, and avoids any seasoning packets. So let me tell you how easy it is to make! …did I mention how I love that this dish is veggie loaded?!? Steam the veggies (I love using my large pressure cooker for this), mash them all together, and pan fry the thick veggie mixture with tomatoes, garlic, onion, and a few spices! I absolutely love using roasted ground cumin. I always have it on hand and it’s a great alternate to garam masala. As much as I love garam masala, depending on which you buy, it can be spicy for the kids. So if you can’t handle the heat, use roasted ground cumin to keep the flavor. I typically do this and then add in a little garam masala for my husband and I (after serving my kids). Garnish with your favorite toppings such as freshly diced onions, jalapenos, and cilantro. Grill up some of your favorite bread and enjoy! That’s it! 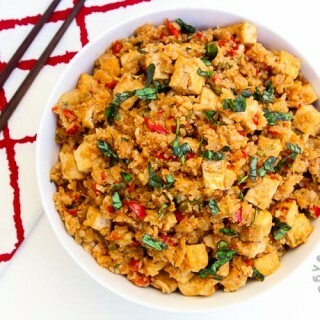 Oh and don’t forget to make double the batch so you have leftovers (tastes even better the following day). 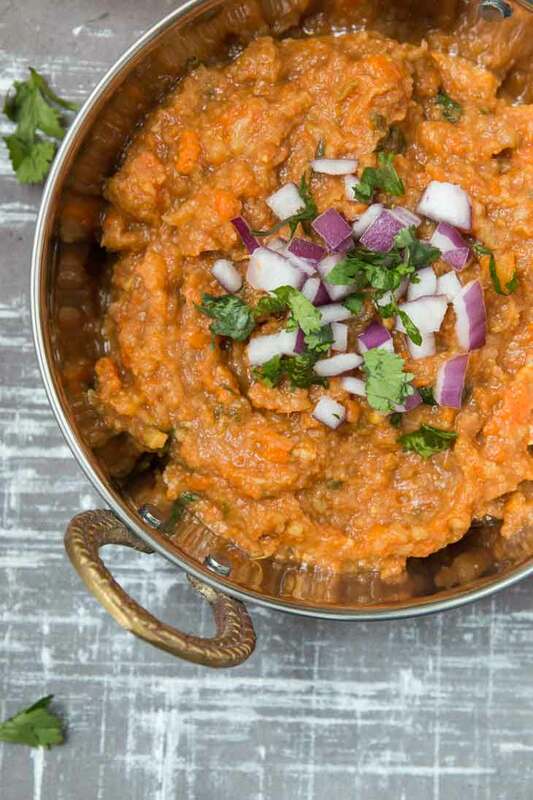 If you’re looking for an easy and delicious way to introduce more veggies into your diet, want to enjoy a restaurant favorite at home, or need comfort food, try out this Pav Bhaji Masala Recipe below! Don’t forget to comment and let me know if you do…I love the feedback! If you decide to share a re-make on Instagram, don’t forget to tag me @vegetariangastronomy #vegetariangastronomy so that I don’t miss it! I love seeing and sharing all your lovely re-makes on “RE-MAKE FRIDAY” over on IG! Pav Bhaji is one of my favorite Indian dishes. It's loaded with veggies, healthy, vegan, gluten-free, and packed with flavor in every bite! 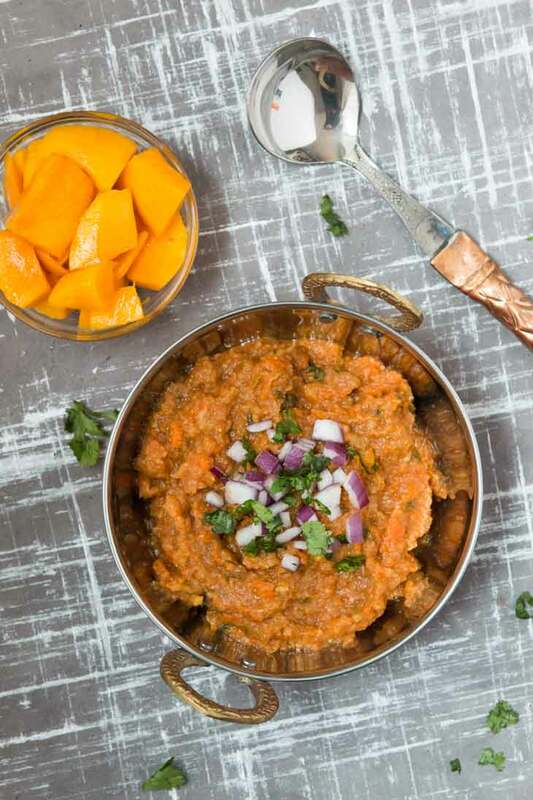 This easy-to-make Pav Bhaji Masala recipe consists of a thick vegetable curry served with grilled bread, and is the perfect meal for the entire family! sourdough bread slices , or gluten-free bread, french buns, burger buns, whole wheat bread, etc. 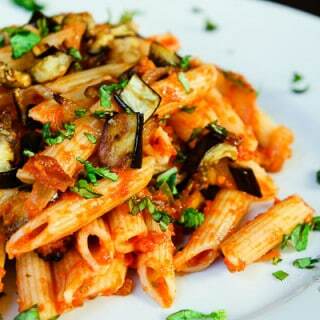 Steam the carrots, eggplant, potatoes, and cauliflower by your preferred method. I always use my pressure cooker, but you can also use a steamer, instant pot, or boil the vegetables until mashable. While the vegetables are cooking, prepare the gravy. In a medium non-stick pot, heat thecooking oil (or vegan butter) on medium heat. Once the oil is hot, add the mustard seeds. Fry for a few seconds. Add the onions, garlic, ginger, and fresh jalapenos (if using). Saute until fragrant and the onions start to become translucent. Be sure not to burn the garlic or onions. If you find this happening, either add some more oil or turn down the heat. Add the roasted ground cumin and mix for another minute. Add the tomatoes, turmeric, ground coriander-cumin, and salt. Turn the heat down to low-medium. Mix and continue to stew the tomatoes into the other ingredients until pasty and softened. Once the vegetables are cooked, completely mash them together with a potato masher (if you need, add a small amount of water). Add the mashed veggies to the gravy and mix completely. Cook covered for another 15 minutes, stirring occasionally. The consistency should be that of a thick vegetable curry. Cook for additional minutes if needed to burn off excess liquid, or feel free to add a little water while cooking if needed. Add the lemon juice, season with salt to taste, and add 1/4 bunch freshly chopped cilantro. If using, add a few pinches of garam masala at this time. Mix thoroughly for another 3-4 minutes. Choose your favorite bread (my personal favorite to go with this dish is sourdough, but traditionally people use buns). Spread butter on both sides and grill on the pan until crispy. (optional) Sprinkle some black salt on one side of the bread. (optional) Garnish the bhaji with freshly chopped onions, jalapenos, and/or cilantro. Serve the Bhaji HOT with the grilled bread and vegan plain yogurt on the side (if using). Make-Ahead Tip: Chop all the ingredients & steam the veggies ahead of time. Then it'll take a quick 15-20 minutes to finish the rest of the dish. Vegetables: Feel free to omit any vegetables you do not like or add others that you do enjoy (such as peas). If you omit the potatoes, the consistency will not be as thick. The carrots add a hint of sweetness to the dish, but I've omitted them several times and it still tastes great (no sugar needed). Roasted Ground Cumin: This is one of my favorite spices to have on hand! It's definitely different in flavor than it's non-roasted counterpart and allows me to keep this recipe spice-free for those of you who do not like the heat. It's available at most stores, but if you don't have it on hand, I'd recommend using plain ground cumin and some garam masala. For Toddlers/Kids: Omit the spice if needed. Some garam masala are spicy, so just use roasted ground cumin instead. You can also drizzle some of your favorite vegan plain yogurt (my current favorite is Kite Hill almond milk plain or Forager cashew milk plain yogurt) on top or mix it into the vegetable curry for a milder flavor. how much garlic? I'm making it right now! Will report back and let you know how it turns out. :) Also no white onion, had a mix of yellow and red. And not quite sure about the roasted ground cumin vs coriander-cumin powder, but will give it my best guess :) Thanks! Oh sorry! I just realized I forgot to state the amount of garlic. About 4-6 cloves is what I typically use (I love garlic). Yellow and red onions should be absolutely fine. I've actually used red before and it still turns out great, just be sure to cook them enough. Roasted ground cumin is actually quite different than coriander-cumin powder. It has a different flavor to it because it's roasted. But if you don't have it, it should still turn out fine. I'm not a huge fan of the store-bought pav bhaji dried masala, and the roasted ground cumin is my sub for it, but if you have that masala you can add a little of it as well. Oh and for kids, I typically will add very little (or none) jalapeno - honestly just depends on how spicy they are and how much they can tolerate. If you don't add it to the actual dish while cooking, you can always finely chop it and serve it raw on the side to garnish for some added spice. Hope all this helps! Let me know how it turns out! Also when making this kid-friendly, how much jalapeño do u generally use? How much salt do u add while cooking? :) Thx! Did you end up making the Pav Bhaji? How did it turn out?? 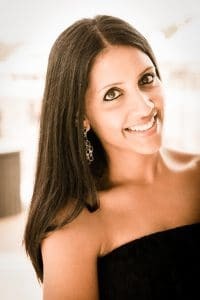 Thanks Anjali! It turned out great and it made a lot so I've been sharing it around too. :) First time I've ever made pav bhaji and your recipe was great, thx again! Great to hear Ami! Thanks so much for trying out the recipe. I love my home-version so much more than most resturant pav bhaji because you can control what spices and ingredients go in. And once you make it a few times, it's honestly very easy, not to mention super healthy! For my kids, I've even blended it when they were little. Now of course they eat it as is, but they loved it when they were little as well. Anjali, I never had recipe for Pav Paji so decided to use yours! It turned out AMAZING! Thank you :). I followed the recipe exactly and it turned out perfect. I went light on the Jalapenos so my kids good eat it too. I'm looking forward to seeing their reactions. It's one of my favorite Indian meals, and perfect for the entire family! I've never been a huge fan of resturant-style Pav Bhaji, so I had to come up with my own home-made clean version. Hopefully the kids love it, let me know...it's loaded with veggies! When my kids were younger, I actually used to puree/blend the final mixture. It's soft and mashed as it is, but it helped for sure especially for the really little ones! Thank you for letting me know and trying out the recipe!! This meal would be perfect for you guys...full of veggies! I've never heard of it being called dhania :) definitely try this out and happy Navratri! This recipe looks absolutely delicious Anjali! I have never had Pav Bhaji Masala in my life.... So i need to give this recipe a try. Bread, naan or roti will be so yummy with this dish! Never??? Ok you need to change that...it's SO SO good! Has your mom ever had it? And yes...half of why i like this is because it's served with toasted bread and black salt haha! Yummy! I love the flavors of this recipe. I will have to try this one soon! Anjali! This is such a beautiful recipe. You don't know how I am looking forward to making this great Indian dish. Thanks! Thanks so much Ginny! Let me know if you try it! I've never had this before. With that list of veggies it has to be good! Hahaha i highly doubt my mom has had it but I will have to check with her.. Thanks again for this great recipe. This has a good flavor but I made it just as it was written but I was disappointed that it was not at all spicy. I will Make it again but will up the spices. The pressure cooker was a great idea. So the spice from this recipe comes from two places - the fresh jalapenos I had in the recipe as optional (but highly recommended for the heat), and the garam masala if yours is spicy (since there are many versions). I always try to have both a spicy and non-spicy version for those who do not like spicy things (and for kids who can't handle heat). So super easy to make it spicy...just add as many fresh chopped green jalapenos as you want when you add in the onions and garlic as the recipe states. You can also top it with fresh raw chopped jalapenos for spice.